simply by dividing both sides of the original equation by or . I did this same this year. Except later on, a few weeks ago, I saw a post on twitter talking about introducing trigonometric identities through graphs on the unit circle — and having kids come up with their own identities. I loved this idea and planned to make a whole thing about of it. So far I’ve given students one thing I’ve made as a result of this idea (and that worked out super well). From this, students were able to come up with the three Pythagorean Trig Identities we saw above, but also a fourth one that was totally unexpected. Instead of doing a whole unit on Trigonometric Identities, the other teacher and I are slowly giving students a problem here and a problem there to practice with and find new strategies, over a couple weeks. I hope that works! And maybe if I have time, I’ll make a follow up activity. Maybe giving the drawing below but without anything labeled but the radius of the circle, and having kids fill in each of the lengths and find various identities? They can use the ratios of similar sides… but also if triangles are similar, they can also use the ratios of the perimeters! Or knowing that the ratio of the areas of two similar figures is simply the square of the ratio of two corresponding sides? Also, maybe just maybe kids could generate inequalities — like the area of this one triangle will always be less than the area of this other triangle? I don’t quite know as things aren’t fully formed in my head yet. If anyone has any ideas, or existing resources, pass ’em along! Really cool idea Sam. Super cool actually. Just gotta point out that I think there are five similar right triangles in your diagram. Don’t forget “little red” on the right! The resulting identity (not gonna spoil it) is a bit similar to the last of your four, maybe not as interesting. Great activity, Sam! Thanks for sharing. Good job.Thanks for sharing these important identities.Keep it up!! A really nice idea and exploration topic for students, my trig students almost always struggled with this piece, I am thinking of adopting this idea. Well done. Hey Sam, this is very cool! I don’t know if this would work, but maybe you could have them try to solve several trig proofs where they have to use one of the FOUR trig identities at least once. I do exactly that paper folding exercise when I do angle sum formulae!!! Cool. 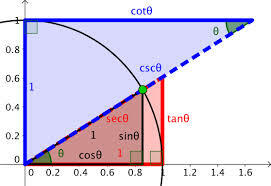 I keep on meaning to do a piece for the Intelligencer with visual versions of all the trig formulae. I see five right triangles. The fifth is similar to the other four. Wow, thank you so much for sharing!!!!!!! I’m totally using this next year if I’m teaching Precalc! Are you willing to share a word doc of this? Just added it to the post!